The Group began in 1988. After Woman’s World Day of Prayer that year, a small number of women expressed the desire to learn more about their faith and their role as Christian women. To do this a flexible format was established which included Scripture study, silence, prayer and discussion. To help us we have used articles and books. Over the years women have moved in and out of this very informal group. We have devised liturgies to mark the seasons and for appropriate occasions. At the moment we have eight members, one of whom has been in the group since the beginning. Our aim is to foster mutual friendship and support by learning from and sharing with each other. The group meets fortnightly, with a break during the summer. At each meeting we listen to music, pray with a passage of scripture, and discuss issues drawing on our life experiences, knowledge and interests. We have used books such as “Prism of Love” by Daniel J O’Leary and “Wayfaring” by Margaret Silf to help us concentrate our thoughts as well as various articles from The Tablet. We also respond to diocesan and parochial questionnaires and requests for information. At Christmas, Easter and before our summer break we celebrate short liturgies followed by a shared meal. Anyone interested in finding out more, or wanting help in setting up a similar group, please contact Veronica Camilleri (02920 751627) or email womensgroup@talktalk.net. 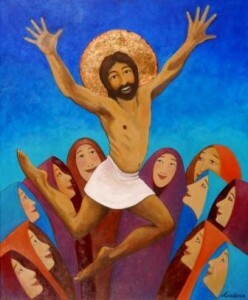 This picture is from the “Jesus Laughing and Loving Collection” of the Major Issues and Theology Foundation and is reproduced here with permission. The collection can be viewed at www.miat.org.au.